Minneapolis, MN – ABDO (abdopublishing.com), a leading educational publisher, is proud to announce the launch of its newest imprint, Calico Kid, under its illustrated titles division, Magic Wagon. 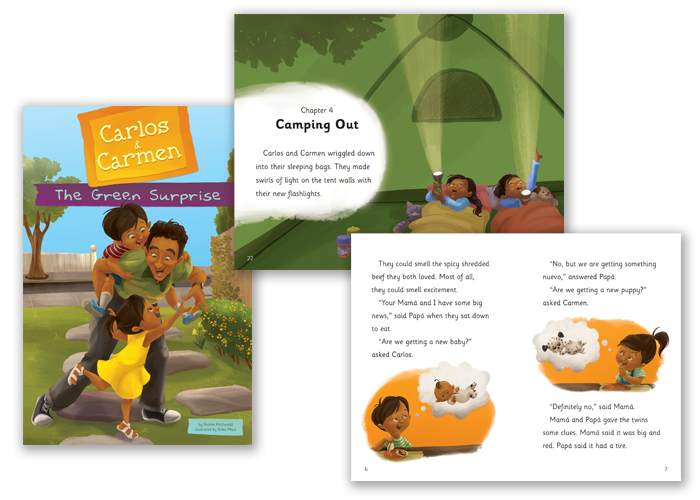 The imprint fills the need for an initial step into chapter books for Magic Wagon, and debuts with the exciting new series Carlos & Carmen. Over the last year and a half, ABDO has focused on revitalizing the Magic Wagon division and its overall offerings. ABDO’s in-house Editors and Creatives have worked alongside the Sales and Executive Teams to rethink the division against the needs of the market. “We are constantly hearing a need for lower level books from the field,” states National Sales Manager Monte Kuehl. “Adding an introductory chapter book imprint to Magic Wagon not only answers the call from our customers, but further develops this division by giving us the ability to pair [Calico Kid] with Calico,” the division’s grade 3–8 chapter book imprint. Both Editors and Creatives have combined efforts to produce the best possible results for Magic Wagon. “Magic Wagon is dedicated to creating diverse, inclusive titles with original story lines and illustrations that inspire learning and imagination,” states Magic Wagon Director Megan Gunderson. “Being able to add so much full color artwork to these [beginning level] chapter books gives a reader at this stage a great sense of context for these stories,” adds Candice Keimig, Art Director at ABDO. Now with six, soon to be seven, unique imprints for PreK–8 grade readers, Magic Wagon ramps up its published titles to approximately 60 new titles each year, with all work developed and managed in-house. “These are ‘passion projects’ for many of us,” adds Keimig. ABDO, a family-owned company, has been publishing educational materials for more than 30 years, including library bound hardcover editions and a variety of digital products. The company is comprised of five divisions: Abdo Publishing, Magic Wagon, Spotlight, Abdo Kids, and Abdo Digital. For more information, visit ABDO online at abdopublishing.com.